Was there more to see? I swore T walked me all over the city that first day. Being a big city, we still had points undiscovered and ambled by Parliament and the parks. Having admired temples through Asia, we finally stopped in a Catholic Church here to pay respects and learn about a history of Irish bishops who found a warmer island. We meandered through public gardens, and past the Australia Open site which was quite empty without Nadal’s scratching, Djokevich’s gluten free delights or Federer’s fans. 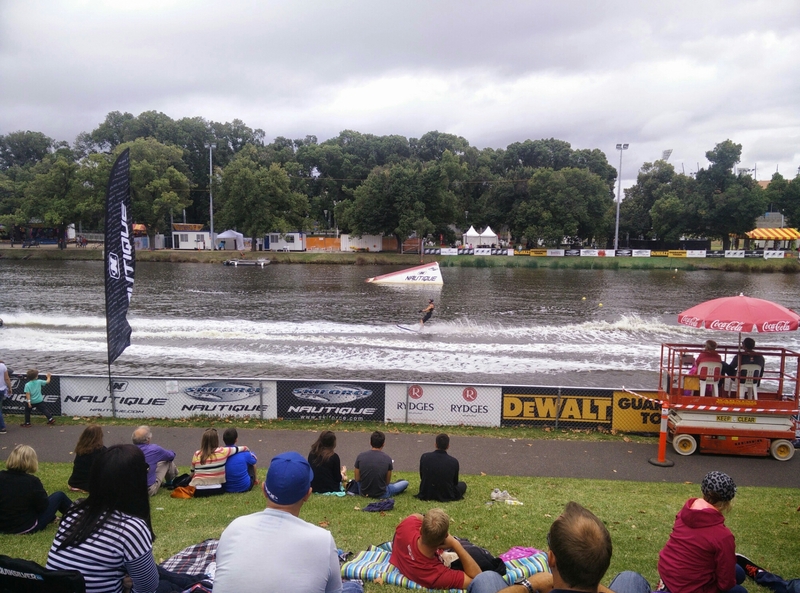 Other games were on a few feet further, as the Moomba festival took over the Yarra River with wake boarding and water skiing contests. Hungry from the athletes calorie expenditure, we hit up a food truck with 90s tunes and more recent burgers. Meandering from there we found ourselves at the real Fringe festival, where a singer songwriter with a guitar crooned to a crowd that bought drinks from a repurposed shipping container while one woman read your fortune and another man explained how you could build your own rocket. Skipsters meet hipsters. T declined the free salsa lesson, but couldn’t say no to a burrito- go figure. So a bookshop, a burrito and a stroll wound down another good day in the city. Though the sun was obscured all day, we had a warm feeling about this place. Wait- too hokey. Even though it was grey, we still wanted to stay? Where is my editor when I need him?